This March, “Has it Come to This” returns to Queen of Hoxton to bring you the smoothest 2-step anthems and the filthiest garage bangers! And we’re bringing down one of the scenes biggest names…. 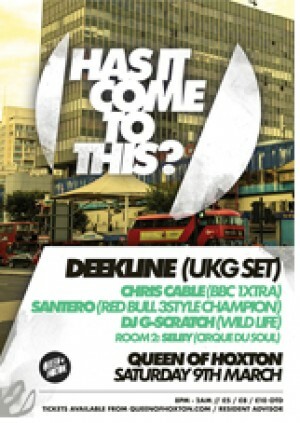 Deekline to play an exclusive UKG set! Alongside him our HICTT residents will be playing all the tunes you’ve come to expect as well as all those you haven’t. Expect a night ‘loaded’ with old-school classics and underground sounds, sprinkled with ‘a little bit’ of cutting edge future garage, and you've got yourself a party worth writing off Monday for! Taking you back to an era before dubstep, grime and electro when garage reigned supreme, Has It Come To This will step back to the early 2000’s helping you relive your youth as we play the sexiest UKG licks and dirty basslines that soundtracked your first trip to second base in 2003, and that will make you fall in love all over again! These are the era-defining sounds that clubland forgot, but we never did!